The Cybernet iPC R1 fanless rugged mini industrial PC is waterproof, shock / vibration resistant with 3G / 4G LTE wireless. 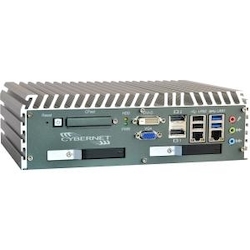 Supports RS-232 legacy serial ports. Affordable. U.S. Tech Support. 3 ? 5 year warranty. The iPC R1 has been fully tested and certified to meet IEC60068-2-27 standards for shock testing and durability. Removable hard drive tray provides ejectable access to an inserted 2.5in SATA hard drive from the rear panel of the computer chassis. Completely protected from the ingress of liquids, your industrial grade PC can easily operate in heavy wash down environments. No fans, no dust, no noise. Capable of silently cooling your industrial grade PC without the hassle of regular cleanings. Mount your Industrial Mini PC anywhere with support for standard VESA mounting options you can attach to virtually any platform. Get fast Internet capability in the field or anywhere WiFi is not available.